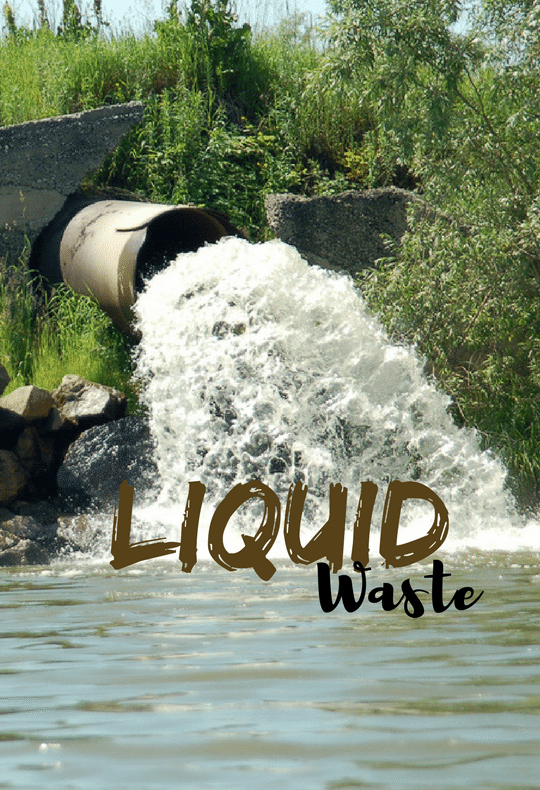 As the name might have suggested, the term ‘liquid waste’ is used to describe any kind of waste that exists in liquid form rather than as a gas or solid. It is a broad term that is used to describe even waste originally produced as a gas but converted to liquid form for easier handling. Common examples of liquid waste are human and animal excreta, household wastewater, cooking oil, fats, and grease. All other types of liquid waste, as a requirement by law, must be properly disposed of – most times by a licensed waste haulier. This is because if disposal of such waste is done improperly, for instance, by throwing out on the ground, down storm drains, or even manholes, this could potentially lead to the contamination of groundwater. You cannot use a skip bin to dispose of liquid waste, so here we will look at the correct way to deal it. The most common kind of liquid waste is sewage and sullage. Sewage refers to wastewater containing human waste, while sullage is the kind of wastewater that generally arises from everyday activities – these include washing and remains after cooking, that doesn’t contain human waste. The final term, runoff, is used to describe water that normally arises from natural activities such as water from rain and water from dams and ponds. Runoff can carry several types of waste with it including human excretes, making it a great health hazard. How Can Liquid Waste Be Removed? Management of liquid waste primarily has its focus on safely getting rid of the waste, leaving no impact on either humans or the environment. The method used should not contaminate surface water or groundwater. The waste should not be accessible to flies. A simple, inexpensive, method should be used to dispose of the excreta and last for at least five years. The method should not leave an odorous smell or be unsightly. Most commonly, human waste goes through a municipal sewerage system, or is stored in septic tanks until it can be removed from a property and properly disposed of. This is a job for professionals. Affluence is a term commonly used to describe wastewater of any type that is discharged from a pipe, for instance, by factories. Normally, affluence produced by industries must meet a fixed set of guidelines, usually provided by municipal councils and in some cases by the territorial or federal Government. For instance, there is a limit as to how much certain chemicals can be released into a water body. This kind of harmful waste is also expected to be treated before safe disposal into the environment. However, this is beyond the scope of an everyday citizen since there is no particular action you can, or are expected to take all of you. Anyone with concerns about industrial waste water is advised to file a complaint with local environmental health officers to have the matter investigated. The final kind of waste that needs to be taken care of is the runoff, also commonly referred to as stormwater, is perhaps the most important to have taken care of because of the great consequences it can have if largely ignored. In highly populated areas, such as towns and cities, runoff is usually diverted into drains which often run untreated into the sea. In rural areas, local officials and residents usually deal with this by proper planning, to try to prevent harmful runoff from entering water supplies, which could potentially lead to an outbreak of waterborne diseases, houses and flooding onto roads. First, the likely routes the storm water is likely to follow is identified (this is usually downhill, towards water channels). Once the problems at hand, if any, are identified, development agents are expected to design and implement a solution. There are several different sanitation methods that can potentially be used to safely collect and store liquid waste, and all vary vastly in terms of usability and methodology of application, location, and the type of waste. Most of these are operated and maintained by local authorities and not something the average homeowner needs to fully understand. Septic tanks have the most common application in water carriage sanitation systems. Once human waste flows into the septic tank, it is stored for a while as it undergoes partial treatment, and then it is removed and taken to a waste treatment facility. Septic tanks are usually made of concrete, although polyvinyl chloride (PVC) is also commonly used, they are mostly located underground with inlet and outlet pipes. The kind of treatment carried out is only partial and the affluence may still contain harmful bacteria. The sludge that builds up in the septic must be periodically removed.